When you think of the history of London, you might think of its Kings and Queens, its grand buildings and its stately traditions – you know, the ones which involve lots of fanfares, fluffy hats, sceptres and Bishops. But, if you head to London this August, you should be prepared to see a whole different side of its heritage: a heritage that’s loud, vibrant and multicultural, which swaps trumpets for steel drums and stuffy ceremony for jubilant celebration. I’m talking, of course, about the Notting Hill Carnival: the largest street party in Europe, and the second-largest street party in the world. 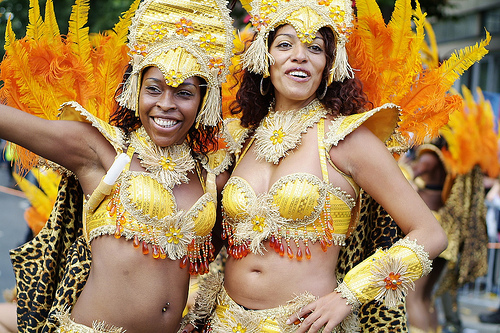 It’s when the capital’s West Indian community comes together and puts on a parade that’s as bright and glittery as it is loud and proud, and every year it attracts millions of revellers all intent on shaking their tail feathers. If you fancy making the trip to the big city for this party like no other, be sure you’ve booked yourself into one of the more comfortable central London hotels on offer. Hotels in Soho are fifteen minutes away from Notting Hill by tube – that’s close enough to be accessible but far away enough from the action that you’ll be able to get a good night’s sleep! It is a two day event, and unless you’re a real party animal you’ll find a brief respite for a shower and a nap are very welcome. Because when I say ‘two day event’, I mean two whole days of partying: on 9 o’clock on the Sunday and Monday of the bank holiday weekend, thousands of men and women wearing very skimpy, shiny outfits and explosions of feathers around their heads and necks will gather around floats to prepare for the parade. They’ll double-check their diamantes are all fixed tight and then, on the dot of nine, they’ll start shimmying for all they’re worth through the narrow streets of Notting Hill to an infectious beat played by 40 sound systems and countless steel drums. Then the party will continue late into the night, punctuated by meals snatched at the delicious jerk street vendors that litter the festival’s route. So when did the carnival start? Well, its roots are in 1958, when race riots exploded in the Notting Hill district, an area where a large number of Caribbean immigrants lived. Two nights of terrible violence and destruction led to four hundred people being arrested – and for one woman to organise a celebration of West Indian heritage. This was Claudia Jones, of Trinidad and Tobago, and ‘The Mother’ of the modern festival. In 1966 Claudia’s event was, by chance, combined with a party for Notting Hill’s local children organised to celebrate multiculturalism and diversity. The children’s party was turned into a carnival as a steel band from the West Indian event took to the streets to entertain them. Within ten years, over 150,000 people were attending the ebullient, Caribbean-feel carnival which aimed to be both an expression of West Indian pride and a move towards more positive race relations in the area. The early years of the carnival weren’t without clashes and violence, but its flamboyant spirit has endured riots, money issues and more. It’s weathered stormy British weather, and throughout, brought the sunshine and style of the Caribbean to the UK capital for a weekend. Really interesting story about Notting Hill Carnival . I feel great to read it .